Prior to the events of BlazBlue, humanity was on the verge of extinction from the “Black Beast”, a creature of Darkness. The world was saved by six heroes who wielded magic. They helped humanity create “Armagus”, a fusion of magic and technology, to defeat the Beast. After the war, the Novus Orbis Librarium Armagus (the Library or NOL for short) was created to govern the world with the use of Armagus. A great deal of dissent was caused by the Library, partly due to Armagus’ use in nearly every facet of society, and the widening socioeconomic gap between those who could and couldn’t use Armagus. This dissent would eventually form years later into The Ikaruga Civil War, when the Ikaruga Union openly rebelled against the Library. After the war, the Library imposed a harsher rule on the world, punishing any rebellion against the Library with the death penalty. In December A.D. 2199, several years after the Ikaruga Civil War, a branch of the Library was utterly destroyed by an SS-class traitor named “Ragna the Bloodedge” also known as “Mr. Grim Reaper”, in an attempt to destroy the entire Library. The Novus Orbis Librarium Armagus, hoping to stop him, immediately put the largest bounty ever for anyone who could capture him. Interestingly, Ragna possessed a powerful form of Armagus known as the “Azure Grimoire” , also known as the BlazBlue. This led to the Librarium, as well as the Ikaruga Union and other fighters, to be after not just his bounty, but also his grimoire. BlazBlue is a anime-styled fighting game. It shares great commonality in terms of gameplay and controls with its older cousin, Guilty Gear. That being said, it is NOT a Guilty Gear clone. The controls for BlazBlue are much smoother and have a better flow. There is very slight learning curve for this game: it's something you can pick up from the store and play almost immediately. Most, if not all, fighting games will get repetitive after some time- there can only be a certain amount of combos and buttons to mash. BlazBlue, however, is something a little deeper, though its outsides may not show that. It's your usual fighting game fare when it comes to buttons: X, Y, B, and A, being your weak, normal, strong, and special attacks. The "special", or Drive attack, is used by characters to unleash whatever unique ability or gimmick they have. For example, Noel Vermillion. Using Drive will activate her Chain Revolver ability. This makes her glow a certain color (default color scheme gives her a brilliant blue silhouette). From here, she can unleash a deadly (and often times overpowered and broken) set of moves in a lightning quick combo. Other characters have different Drives which are related in one way or another to their special moves. Other features, such as dash canceling and Barrier blocking (100% prevention of health damage) add a level of gameplay lacking in many of today's fighters. You can choose between the analog stick or the D-Pad to control your character (I personally prefer the D-Pad, growing up on Mortal Kombat and Street Fighter). Up is Jump, Down is crouch, and L/R do their respective movements. Double tapping U, L, or R will cause a dash or a double jump. Standard stuff, nothing too special here. BlazBlue boasts 5 modes of play: Arcade, Story, Versus, Score Attack, and Network. Arcade is essentially the arcade version of this game for one player, running through a set of enemies for a high score. Story immerses the player in the world of BlazBlue, and its intricate and surprisingly complex story for a fighting game. Each character has their own route, and in those routes are multiple paths. Versus is what it is: You and a buddy pummeling the ever-living crap out of each other. Score Attack is a chance for you to run up the score and show off to your friends. Now here's the kicker: Network Mode. Yes, it is just you fighting others online, but there's more to it than just that. Network mode allows you to track down and play the best of the best BlazBlue players on your given system. Instead of waiting for some big gaming convention to gather the greatest, you can now chum online and watch your favorite character beaten to a pulp by your idol gamer. Whoa now. Back up the awesome bus. We missed a stop. BlazBlue is a 2D fighter. Being a 2D fighter, I find it to be of common opinion that it FAR outstrips 99% of 3D fighting games in visual appeal. The color scheme on all menus are absolutely eye catching. The character designs are beautiful and very easy on the eyes. Before anyone says anything, yes, I know they do resemble the Guilty Gear cast. The backgrounds have a prodigious amount of detail for being... well... backgrounds. Fighting games are not usually known for their soundtracks. There will be the occasional cult classic BGM's (Mortal Kombat theme, anyone? ), but nothing much else. BlazBlue boasts a soundtrack of epic quality. Every character has their own unique theme song, and some characters, such as Ragna and Jin, have theme songs specifically for their match up. The opening, which I pasted above, is your standard J-Pop, by KOTOKO, who are by no means a small-time musical group. The music was so good, it seems, that a Limited Edition with a two-disc OST was released. I will tell you that it is worth the extra effort and money to obtain. The background to the story is at the top of this review in italics- I won't recap. I also won't put any/many spoilers in here, so those of you who have not played the game won't have the fun of Story Mode ruined for you. I'll just say that it's the deepest and most intricate plot I've yet seen in a fighting game, and I've played quite a load of them. It just pulls you in and entrances you, sucking you deeper into Story mode. 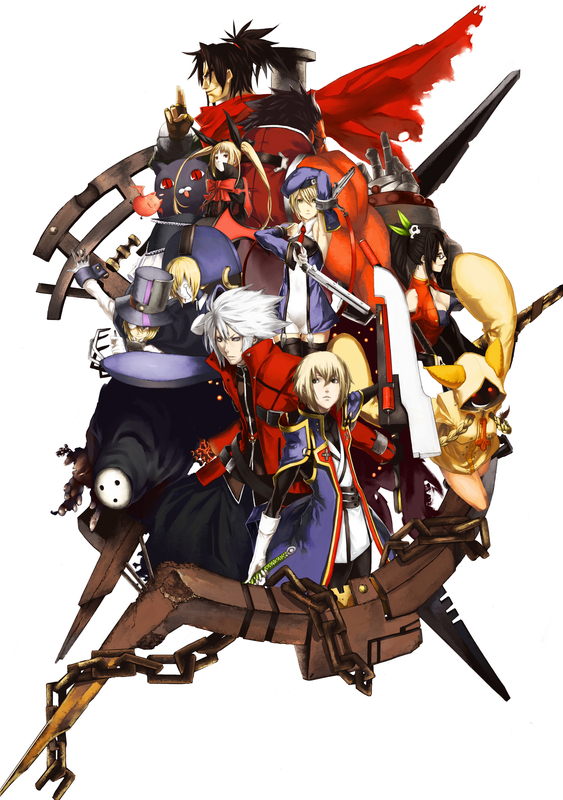 The cast of this game is mainly made up of twelve unique characters: Jin, Ragna, Noel, Rachel, Tager, Litchi, Bang, Arakune, Hakumen, Nu, Carl, and Taokaka. Each character (except for maybe Carl) brings their own back story and personality to the main story, and make it the amazing plot that it is. In summary, this game is one that will never truly get old. You'll grow sick of playing it for 8 hours in one day, but pick it up the next time the sun shines upon your system. Nice review man, I'll have to check it out. i typically hate anime-type stuff like this (excepting cowboy be-bop, samurai champloo, and detroit metal city) and dismiss it as weaboo. this on the other hand looks genuinely interesting. will deff look into it. I don't completely agree, but still a great review, keep it up! do you play with an arcade stick?